Love among the geezers, rather staidly told but touching nonetheless, by Texas author Sanford (Crossing Shattuck Bridge, 1999, etc.). Eleanor Bannister, 69, is a recently retired schoolteacher who remembers practically everyone in her small hometown of Grover, Texas, from the days when they struggled through the alphabet in her classroom. It’s like a maternity of sorts, and it seems to have saved the single and childless Eleanor from the fussy eccentricities so often associated with spinsterhood. But Eleanor is an Old Maid all the same, and the rhythms of her life—church on Sunday, gossip with her friend Grace, corn flakes for dinner—suggest a familiar solitude that expects no further surprises from life. Eleanor is unprepared, then, for the arrival of Abel Brown, an itinerant 70-year-old carpenter who lives in a trailer and shows up at the door one day asking Eleanor to rent him the rundown cottage she owns across town. When she refuses (on the grounds that she’s planning to sell it), Abel promptly offers to fix it up for her so that she can get a better price. It’s less trouble to agree with Abel than to argue with him, so Eleanor does—and begins a new and wholly unexpected friendship that soon blossoms into romance. By the time Abel has finished the repairs, he and Eleanor are deeply in love. What’s to stop them from getting married? Nothing at all—although the arrival of Abel’s ten-year-old granddaughter (who comes to stay with him while her mother goes looking for her errant husband) complicates things a bit. 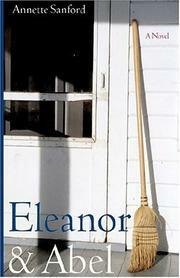 But Eleanor takes in both Abel and the girl and sets up something she has never had since her parents died—a home. Pleasant enough but curiously dull, with few surprises and little suspense. Best for those greatly devoted to love stories in the Bridges of Madison County vein.